Here is a new deluxe lens cap for the Sony Alpha A700 Digital SLR camera that is equipped with the DT 16-105mm F3.5-5.6 kit lens. This new style deluxe lens cap comes complete with the elastic leash to prevent loss, center release buttons so it will not interfere with a lens hood, and no ears sticking out to make it easy to knock off of your camera. The problem with the Sony battery chargers and AC Adapters is the detachable power cord. If you are like me and have a tendency to put things where they won't get lost and then can't find them then here's another cord for your unit. Good grief where do these things go. 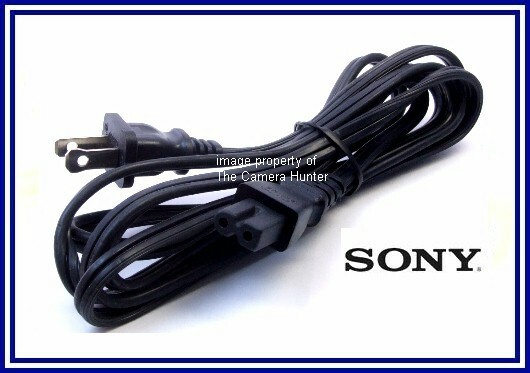 This cord is brand new and will fit all of the original Sony battery chargers and AC adapters that use a cord that has a female end that looks like the one in the picture. The items I have here and have actually used the cord on are the BC-V615, BC-V615A, AC-VQP10, BC-VC10, AC-VQ50, BC-VM50, AC-VQ11, AC-V700A, AC-SQ950D, BC-TR1, BC-TRM, BC-TRF, BC-TRP, BC-TRA, AC-LS5, and AC-VF10. That is quite a list and I have worked hard to cross reference as many battery chargers, camera models, and AC adapters, as possible but the proof is in the picture. If it looks like it will fit then it will. I guess it's a good thing they made them all a standard size. The cord is brand new, never used, factory replacement.